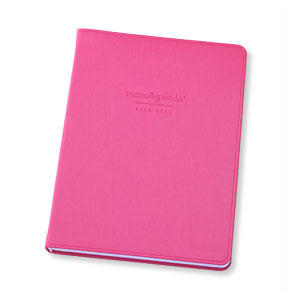 momAgenda offers an array of great tools to keep mom's day organized. Stylish solutions, in the form of calander's, planners, accessories, and other organization & gift items makes momAgenda your one stop shop for peace of mind and "smooth sailing" in your daily mommy obligations and adventures! •Unique week-at-a-view format with space for mom and up to four children. Features monthly views too. •17-month calendar runs from August 2010 through December 2011. •Featuring the momEssentials pamphlet that can be removed and reused from year to year. •7 stylish, stain-resistant colors: Fuchsia, Zebra (New), Tangerine, Chocolate, Turquoise (New), Ruby (New), and True Purple . •Personalization is available in two fonts: print or script. Choose from three colors: gold, silver or blind-emboss. Please note: Only letters may be used for personalization, no numbers. *Zebra books are embossed in gold; therefore, we recommend personalizing them with gold lettering. Truth be told, I'm a perpetual list maker....the only problem is; though I mean well, at times the scattered nature to my note taking ( various notebooks, slips of paper etc.) can lead to inevitably forgetting something. With school now in full swing, reviews, interviews, events......and so on - I have a ton to juggle everyday. The momAgenda provided the perfect solution to a problem that has existed a while in our house....I have every one's schedule right in one place - no double scheduling time, or forgetting important appointments or activities! The momAgenda allows me to keep track of all four of our schedules, and keep my most important contacts and addresses all in one place! Have I mentioned before how giddy organization in my household makes me?! 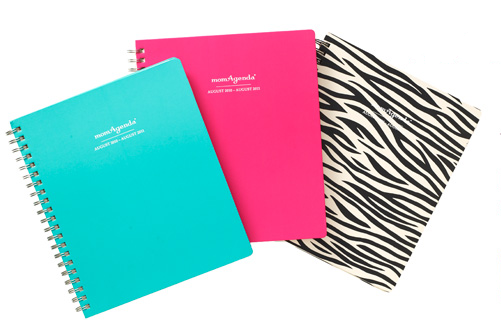 The momAgenda not only keeps savvy mom's organized, consider it a fashion statement!With beautiful color and print options, it's sure to also be every mom's favorite accessory! Get organized in style with the momAgenda! One Lucky Reader will receive a Desktop Planner in their choice of color! Which of the other great item's that momAgenda offers would you like to add to your daily mom routine?! The comment is considered your entry. momAgenda All-in-One Folio has to be my favorite. my mother needs one of these! I would love the Mom Agenda desktop in Zebra...I have such a hard time remembering things! I would love the Mom Agenda desktop in Zebra. I have a busy life as a stay at home working mom. love the mom agenda desktop in zebra. I love the kitchen folio. My oldest starts kindergarten this week and I'm already drowning in paper work. im following you on tiwtter! I would love the grocery list pad. I follow momAgenda on Twitter. The Chores Pad looks pretty cool too! I would love the Kitchenfolio! I entered the Apple Mini giveaway! I entered the ArtSkills giveaway! I like MomAgenda on FB - Cari S.
My agenda has expired, and I need a new one. This would def help me out. One of the other great MomAgenda products that I would love to add to my house is the School Years book. I would love to keep organized what my son has done in school, awards, achievments, etc... My mom had one for me and my sister when we were kids - they are so cute! I'm a brand new GFC follower (avalonne83). I'd like the mom agenda in pink. Hello, I think the Back-to-School Survival Kit would be pretty cool to have. Thanks for a great giveaway! I love their Faux Crocodile momAgenda Desktop.